Check out my Toki Poki card compared to my brofur from another mofur, @BorisKitty! You can get more views of our cards here and here. Boris has more white on his face than I do, but we certainly look like we're related! I read two books for this month's #readpawty. The first one was "Homer's Odyssey: A Fearless Feline Tale, Or How I Learned About Love and Life with a Blind Wonder Cat" by Gwen Cooper. 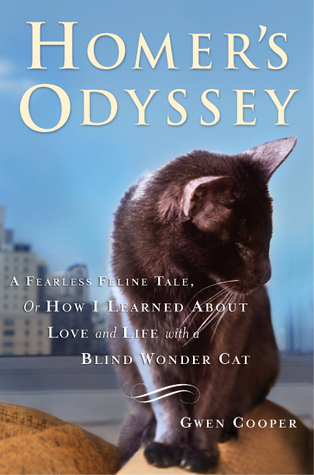 Ms. Cooper writes about Homer, the kitty she took in as a little bitty kitten who had to have his eyes removed when he was very young. The title really sums up the book. Ms. Cooper is (for most of the book) a single gal living with three cats. Her kitties, the focus being mainly on Homer, teach her about love and what is important in life. All three cats have very different personalities and they all have lessons to offer about life. Specifically, Homer shows her that, even though he is blind, lack of sight does not lessen his enjoyment of life. He is a happy cat and believes there is no other way to be. There are wonderful stories in the book; some made me and Mom laugh and some made us cry. Have your tissues handy when you read about their experiences on September 11, 12, and 13, 2001. Ms. Cooper shows the kind of passion many pet parents feel for their fur-kids. Fortunately, we have never had to go through a tragedy like they did, but I think my mom would try just as hard to keep me safe. If you are interested in getting to know Homer, you can follow him on Twitter. 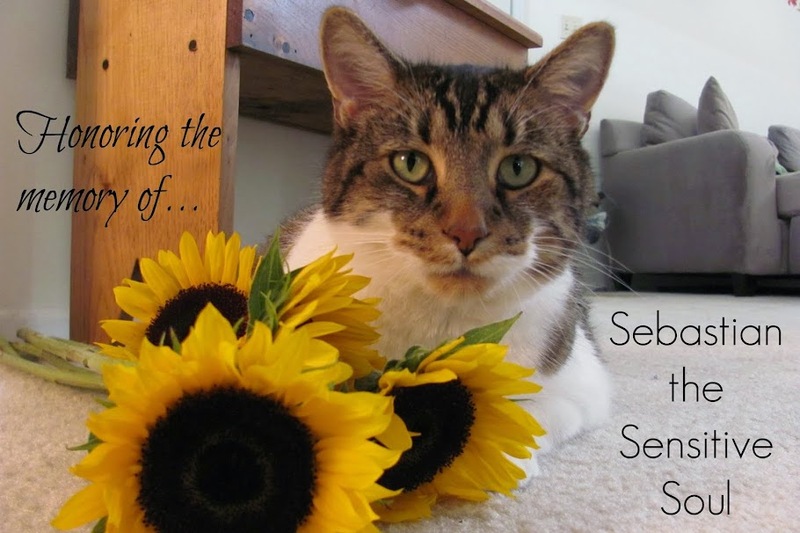 Also, he was featured on a recent episode of "Cats 101" on Animal Planet! He's a really cool cat and I'm glad I've gotten to know him even better by reading his mom's book about him. Homer and his mom deserve extra *nosetaps*. Since this is the final day of Adopt A Less Adoptable Pet Week, I thought I'd introduce you to a few pets in my Mom's life that some people may have seen as "less-adoptable", but to her they were very adoptable! First is Oscar. Mom had him before she had me, while she was living in a different city. 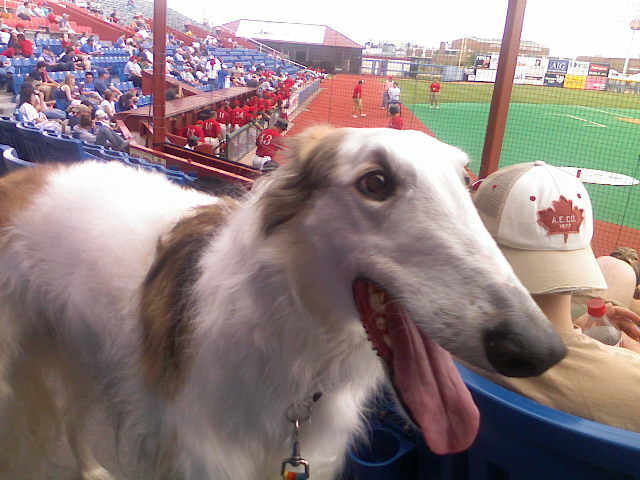 Oscar is a Borzoi that was 2 years old when Mom got him. He had never been a "pet", instead he was raised to be a show dog, but had too many faults. The breeder gave him to Mom on the condition that Mom would pay to have his papers changed over and have him neutered. Mom fell in love with him right away, but things were difficult from the very beginning. Since he wasn't raised as a pet, he had never been inside a house until the day Mom went to get him. He didn't know how to act in a house and had never encountered stairs. The whole idea of being indoors was very unnerving for him and his entire life, he never spent much time inside. He had been cared for by one person before Mom adopted him, so it was hard for him to bond with people and was frightened of most humans he came into contact with. Most people would have considered Oscar too neurotic to make a good pet, but Mom's patience and understanding paid off and they developed a strong bond over the 6 years they spent together. Unfortunately, I never got to meet Oscar because he passed away due to cancer 3 years ago. After Oscar went to the Rainbow Bridge, Mom's dad was anxious for her to get another dog. Mom wasn't ready yet, so Grandpa decided he would adopt one of his own. After reading a story in the local paper about black dogs having a harder time finding their forever homes, he made up his mind that he would find a black dog to adopt. Mom, Grandpa, and Grandma all went to the Kansas Humane Society in Wichita one afternoon and that's where they met Yaz, a corgi mix. His name when they met him was Flash and Grandpa decided he liked his friendly demeanor. They decided to change his name and Mom suggested Yaz, after a former Red Sox player. Grandpa agreed and Yaz became part of the family. He has been a great pal for Grandpa and Mom loves to visit him. He's a spunky, fun-loving little dog that makes everybody who sees him smile! Of course, the most recent "less-adoptable" pet Mom has let into her life is me! When Mom and I met at Wayside Waifs I was 7 years old. It's easy to overlook a chubby, mature kitty that just wants to lay around and cuddle when there's so many frisky kittens around. But Mom saw something in me that she connected with and I did my best to convey what a good kitty I would be. The rest is history! I hope you remember these success stories when you are looking to adopt your own pet. Pay close attention to ALL of the pets who are looking for their forever homes. You never know what you could be missing if you pass up a pet who seems "less-adoptable". Today's featured pet for Adopt A Less Adoptable Pet Week is Itchy. He's a 6 year old kitty looking for his forever home at Wayside Waifs in Kansas City. Itchy is front declawed, so he will need to be an indoor-only cat. Mom has spent some time with Itchy and says he's very sweet and loves to be petted. He gets along with other cats and with children. His previous owners gave him up because of the lady's allergies. Can you imagine living somewhere with a family that loves you, then suddenly being in a shelter? Let's find somebody who can #BeTheChange for Itchy. If you want more info about less-adoptable pets, take a look at what Petfinder has to say. Older pets are the ones hardest to place in homes. So many families looking to adopt a cat will pick a kitten instead of seeing the benefits to adopting a mature kitty like Itchy. It's time to stop overlooking these so-called "less-adoptable" pets and seeing them for the awesome family members they could be! Honestly, I don't see anything "less-adoptable" about Tri at all. He has a black coat and walks with just three legs, but he's young and full of energy. What's less adoptable about that? He's 10 months old and his amputated leg doesn't seem to cause him a problem getting around. He's a typical puppy and is learning to walk on a leash. He already knows "sit" and is treat motivated. Black dogs and cats are often overlooked in shelters, but don't overlook Tri! He would make a great addition to your home and would make a wonderful pal. He's available for adoption from Wayside Waifs in Kansas City. You can #BeTheChange for a cool dog and I'm sure he could #BeTheChange for you too! 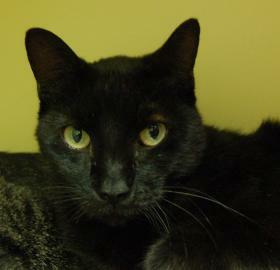 My Wednesday selection for Adopt A Less Adoptable Pet Week is Blackie. Not only is he a black cat, but he's 8 years old. Not long ago, Mom had a family come into Wayside Waifs looking to adopt a cat. The lady said "No black cats, they're bad luck." Well, Mom couldn't believe her ears! She let the family look around and one of the cats they looked at was a black kitten. Mom told the lady that black pets have a harder time finding homes because of superstitions. The lady seemed leery, but relented and the family adopted the little black kitten. Maybe if people realized that black pets are many times the last picked in shelters, they would adopt more of them! If you're in the Kansas City area, come on by Wayside Waifs and take a look at Blackie. Maybe you could #BeTheChange for him. I'm sure he would appreciate it! It's the third day of Adopt a Less Adoptable Pet Week and I'm writing about another doggy that I want to #BeTheChange for. His name is Capone and he's a 7 year old Rottweiler mix. He's available for adoption at Wayside Waifs in Kansas City and has been waiting for his forever home since early June. He's got a great video! Check him out in action! Doesn't Capone look like he would make a great pet? I think so and so does Mom. In fact, she said if we had a house, we would adopt him ourselves. *sigh* I guess he'll have to make a fun pal for someone else. Today I'm featuring a very special dog for Adopt A Less Adoptable Pet Week! Jazzy is available for adoption from Wayside Waifs in Kansas City. She is a one and a half year old, white Pit Bull who is deaf. (By the way, it's also Deaf Dog Awareness Week!) Not only is she less adoptable because of her special needs, she may be a victim of breed discrimination. It is also noted on her paperwork that she needs to go to a home with older children (kids 12 and older only). She's lovely, though! Did you notice her different colored eyes? What a beauty! A dog like Jazzy will need special consideration while training. She may be a good candidate for obedience training through sign language. There are resources out there for owners of deaf dogs. Check out Deaf Dog Education Action Fund. Who will #BeTheChange for Jazzy? I'll be posting all week for the #BeTheChange challenge to spotlight less adoptable pets, but for this week's Anipal Photo Hunt I'll throw in an extra! This is Sarah. She's considered less adoptable because she's 12 years old. Some people don't want to adopt pets of a certain age, but an older pet can have so many advantages! They are usually already litter/house trained, they have settled into their personalities and many times they come with background information. Sarah is available for adoption at Wayside Waifs in Kansas City. Mom received a new #BeTheChange challenge when she was at BlogPaws in Denver last weekend. September 19-25 is "Adopt A Less Adoptable Pet Week" as designated by PetFinder. The challenge was to put the spotlight on pets who might have a more difficult time finding their forever homes. Which pets fit this description? A pet might be considered "less adoptable" for a variety of reasons. Maybe it's a senior pet. It could be a pet with special needs. It might simply be the color of the pet's coat! Check out Petfinder's page to get the stats on these special pets. You might be surprised which ones are harder to place in homes. Mom sees her share of "less adoptable" pets during the time she spends at Wayside Waifs. You can read about some of these pets Mom has cared for in previous posts of mine. Do you remember Luke or Thumper? Mom blogged about Annie, a long time resident at Wayside Waifs who finally found a home after a year in the shelter. All this week, I'm going to be featuring different pets who fall into this category. Today, I'd like to share the story of Andromeda with you. Andromeda is a shy, one-year old girl who has been available for adoption since early July. When you approach her kennel, she will walk up to the front and and rub against the door. She acts like a kitty who wants attention. Unfortunately, if you open the door and reach inside, your hand is going to get swatted. Andromeda is afraid of hands. She is usually very polite and doesn't use her claws, but she makes it clear that you need to stay back! She plays very well with toys and seems to enjoy this kind of attention from people, but she isn't comfortable with you getting in her personal space. It's hard for a family who is looking to adopt a pet to feel a connection with Andromeda if she won't even allow you to stroke her. She needs a special adopter who will understand her fears. She might also be a good choice for an adopter who is looking for a more independent kitty. Keep this in mind if you are looking to adopt: Pets are under a great deal of stress while they are in a shelter. Once they get into their forever home and have time to adjust, they will relax and may show a completely different personality! It's possible that YOU could #BeTheChange for a pet like Andromeda! Please keep an open mind and an open heart when looking to add to your family. You might ask why a kitty would write a blog post about dogs. Well, I don't discriminate, I'm not a hater. 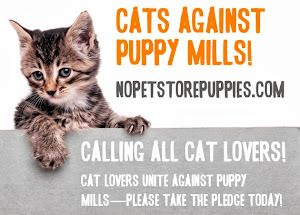 All shelter pets deserve good homes whether they are cats, dogs, rabbits, guinea pigs or any other critter. Each year, more than 4 million dogs end up in shelters and breed rescue organizations. Pedigree created The PEDIGREE Adoption Drive to help shine a spotlight on the plight of these homeless dogs. That's why I had to help out for Pedigree's Adoption Drive. Pedigree is donating food to shelters for every blog post written about it's Adoption Drive by Sunday, September 19. Don't have a blog to post to? No problem! Just go to the Pedigree Adoption Drive Facebook page and "Like" them-they will donate a bowl of food for every "Like" they get until December 31. Even a kitty like me knows that #dogsrule! This week's theme for the Anipal Photo Hunt is all about the conference Mom went to last weekend in Denver: Blog Paws! I was so excited for her to go, but I missed her while she was gone. I knew she would get lots of good info while she was there, so I figured it was worth it. She met some cool anipals while she was there like Cosmo and Pumpkin. She also met Cokie's stand-in. I was just there in spirit! This is the pledge she signed for me to "Be The Change". Now that Mom is back home, it's time to get back to blogging for the shelter pets looking for their forever homes! Get your own office chair, Mom, I took this one over while you were gone! Today I am sending Mom off to Denver to attend Blog Paws 2010 West. She's going out there to learn how to improve my bloggie. I can't wait to see what she learns and how we will change things. I'm hoping to be able to tell more happy stories about kitties at Wayside Waifs that have found their forever homes like I did. This is one of those stories! Luke is a special kitty who did find his forever home recently. When he first arrived at Wayside, his right eye was kind of messed up. 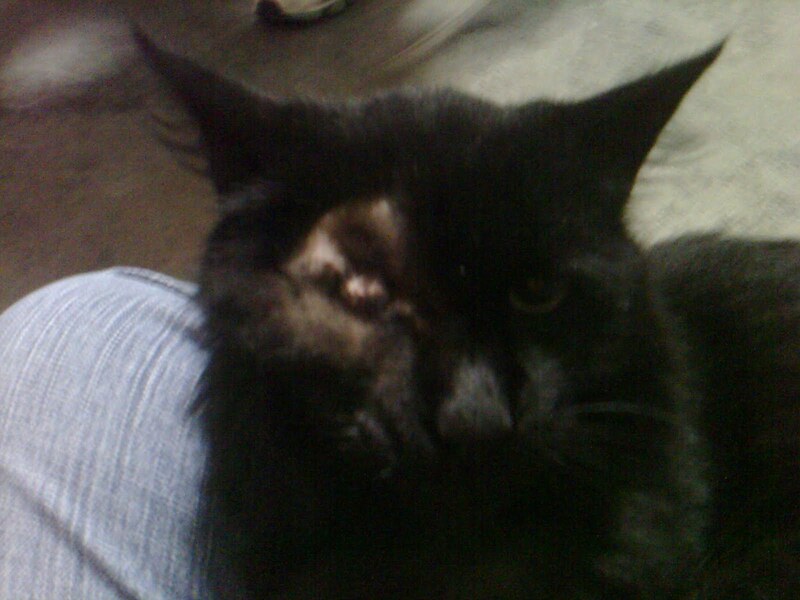 The V-E-Ts at Wayside had to remove it, so now he only has one eye. When Mom met him he wasn't feeling very good and had a yucky tummy. He seemed so grateful to her to have a lap to cuddle in, rather than laying in his kennel on his towel. Mom sat on the floor and he got right in her lap and napped there for the longest time. Soon, Mom had to go home, but she kept thinking about Luke. She worried about his upset tummy and if the right family would come along to give this one-eyed kitty a good home. Mom didn't have to worry for long though...she checked in with another volunteer a few days later and learned that Luke had been adopted! This makes me want to purr with joy! There are so many kitties in the shelter and some of them are a little different from other kitties or have special needs. 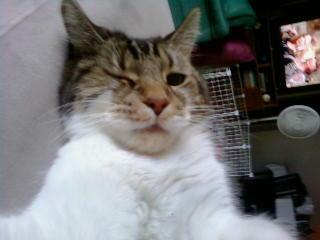 I'm glad there are families out there willing to take in all kinds of kitties, even the one-eyed kitties like Luke! Mom usually cuddles the kitties when she volunteers as Wayside Waifs in Kansas City. She likes to spend time with them because they don't get as much attention as the doggies do-they have tons of volunteers and always get more volunteer hours than the cats. Last week, as Mom was going to the back of the shelter to visit the cats not yet available for adoption, she did something a little different. There's a little room on the way where an adoptable bunny, Thumper, is staying. Mom usually walks by and says, "Hi Thumper" then keeps going on about her kitty business. This time was different, though. She decided to go in the little room and hang out with Thumper. Thumper is a special girl. You see, she only has one ear. Rumor has it that a cat got a hold of her and hurt her ear. The hurt ear ended up having to be removed, but it doesn't seem to bother her. I think it makes her unique! For the record, I, as a cat, would NEVER hurt a little bunny like that. 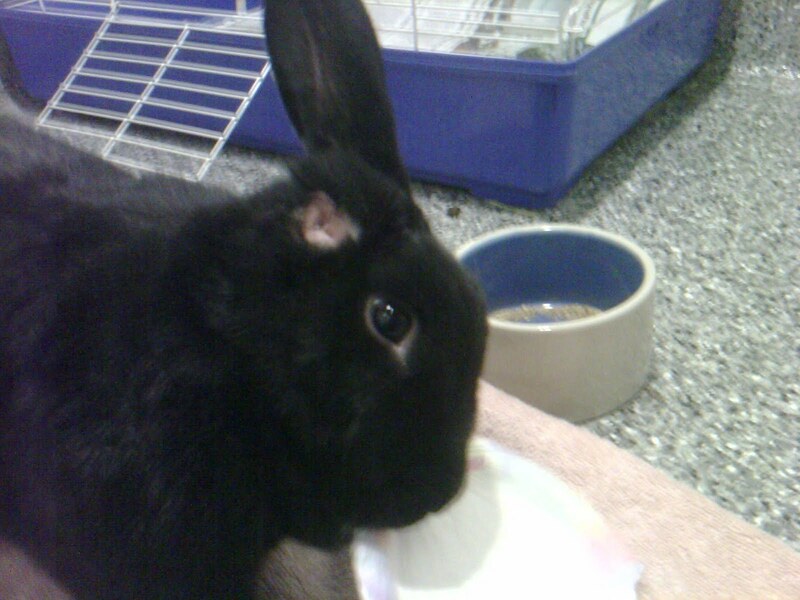 Mom said Thumper really liked to be petted and sat in front of her enjoying all the stroking Mom would give. She nibbled a bit on Mom's shoes and jeans, but was very sweet. I really hope somebody gives her a good home soon, she would make a great addition to a family! I think Mom would take her treats this week if she knew more about bunnies and what they like to eat. Do you have any ideas? This is the fourth installment of Cokie The Cat's "Anipal Photo Hunt". It's all about "My Bed". Well, I must say, I tend to sleep all over the place. Mom bought me my own bed when she adopted me but I would never sleep in it. Instead, I sleep wherever is most convenient. If Mom's working, I sleep in her office on the futon. Once she gets out of bed in the morning, I like to lay in her spot on the bed. Comfy! When Grandma and Grandpa came to visit, I took a nap on the couch with Grandpa so he wouldn't feel alone. At night, when it's bed time, I sleep at the end of the bed or right next to Mom. She calls me her cuddle bug! Nothing like a queen size bed to make a kitty happy! You should join in on the blog hop! What is your bed like?